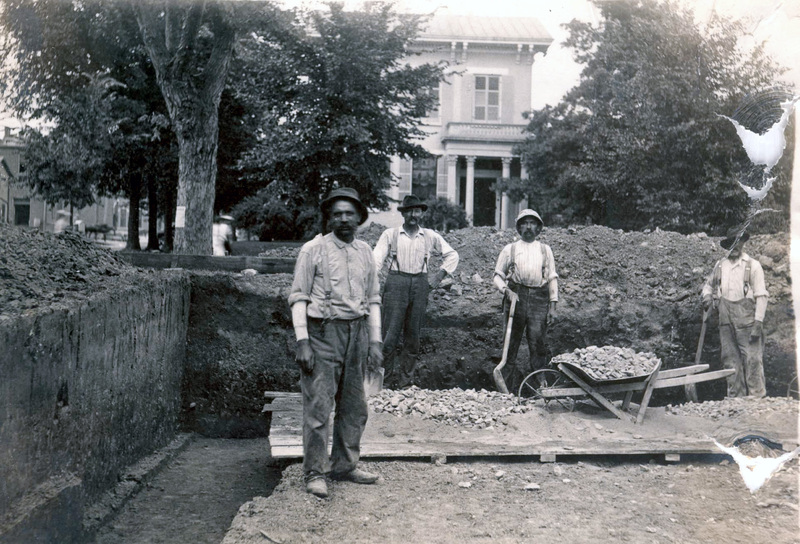 Workers undergoing excavation work on Iowa City's Carnegie Library, which began construction in the summer of 1903. The Carnegie Library at 212 South Linn Street opened its doors on Thursday, October 27, 1904. Funds for the construction of this building were provided by a $35,000 grant from Andrew Carnegie. The portico on the house in the background was saved when that house was torn down. It was moved to a house at 606 S. Johnson street, where it still stands as of May 2013. “Building Workers 1, Iowa City Public Library, 1904,” Iowa City Public Library, accessed April 19, 2019, http://history.icpl.org/items/show/194.